This card cannot be Normal Summoned or Set. This card cannot be Special Summoned except by the effect of "Knight's Title". If this card is Special Summoned successfully, select 1 card on the field and.. 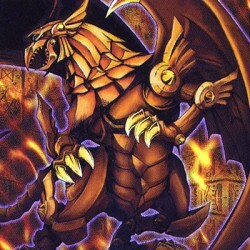 When this card is destoryed by battle and sent to the Graveyard, destroy the monster that destroyed it. While this card is attacking, any Battle Damage either player takes from a battle involving this..
As long as this card remains face-up on the field, increase the ATK and DEF of all Plant-Type monsters on your side of the field by 500 points. ..
You can only activate this card when a Spellcaster-Type monster declares an attack. Each player selects 1 Spellcaster-Type monster from their Deck with an ATK of 2000 or less, and Special Summon it in.. The descent of this mighty creature shall be heralded by the burning winds and twisted land. And with the coming o f this horror, those who drawbeneath shall know the true meaning of eternal slumber. ..
Pay 1000 Life Points. Pick up and see all face-down cards on your opponentsside of the field, then return them to their original positions. (The effects of the face-down cards are not activated. )..